« My heart is broken. Saying goodbye to a friend forever. It had been only two days since we had said goodbye to Buddy and I thought to cheer us up I would take Boomer to Priest Lake Idaho. Although short, it would be a road trip, which is something that Boomer and I both love. Priest Lake is nearby our home, however I have only been there a handful of times and Boomer had never been. It is truly a shame as Priest Lake Idaho is one of the most stunning places in Idaho. On this day I planned to take Boomer to Granite Falls, north of Nordman Idaho. As we drove along Idaho Highway 57 I made a quick pit stop at The Falls Inn to pick up a sandwich for the road. 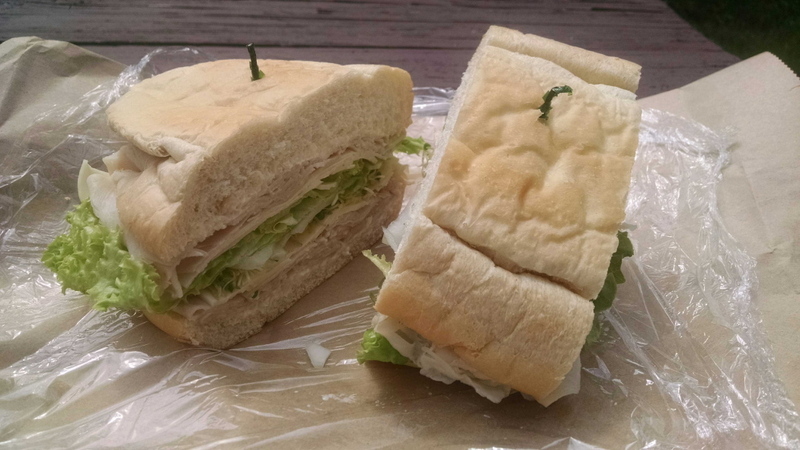 There is something to be said about simplicity and The Falls Inn’s sandwiches are simple yet delicious. The sandwich menu is blunt and to the point. You have 4 choices of meat that you can pair up with mayonnaise, lettuce, sprouts, onions, horseradish, swiss cheese with pickles on the side. Your next decision is the size of your sandwich. Again, 4 options: baby, small, large or loaf. Now no one is going to think you are a sissy if you pick the baby because the baby may sound small but it’s not. I ordered the small and that was plenty. In fact it was so much food that I skipped dinner later that day because I wasn’t hungry. 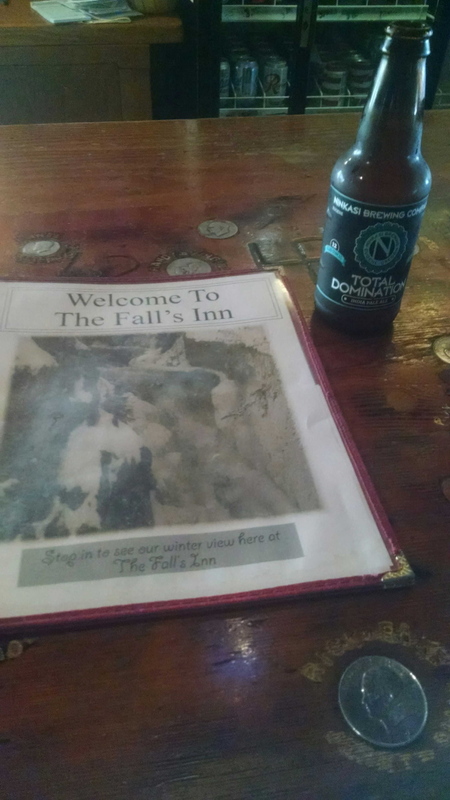 One note about The Falls Inn is that it may have the appearance of a local’s only place but don’t let that deter you, as skipping a sandwich from The Falls Inn is not a mistake worth making. There are also pizzas available which I have had in the past. They are quite tasty however I prefer the sandwiches. 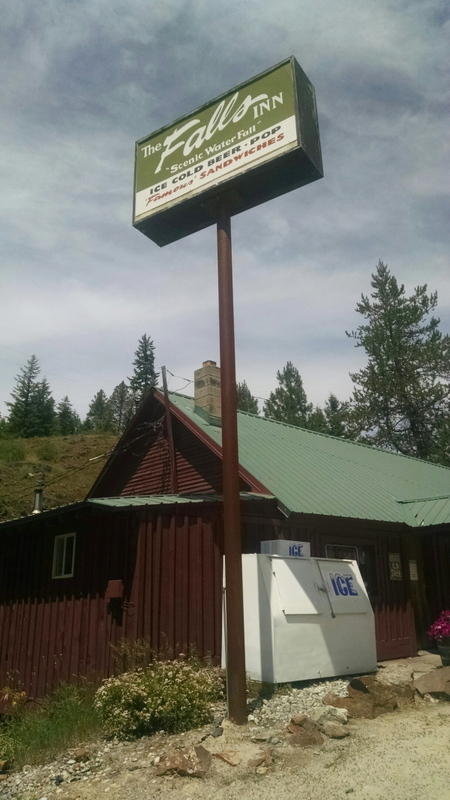 The Falls Inn is located at 8700 Highway 57 in Priest River Idaho. We continued on along Highway 57 passing by Norman following the road until it turned to gravel. The Granite Falls Trail 301 is located about 14 miles (22.5 km) north of Nordman and you will travel along a road less than traveled, however, once we arrived there were quite a few people at the trailhead. 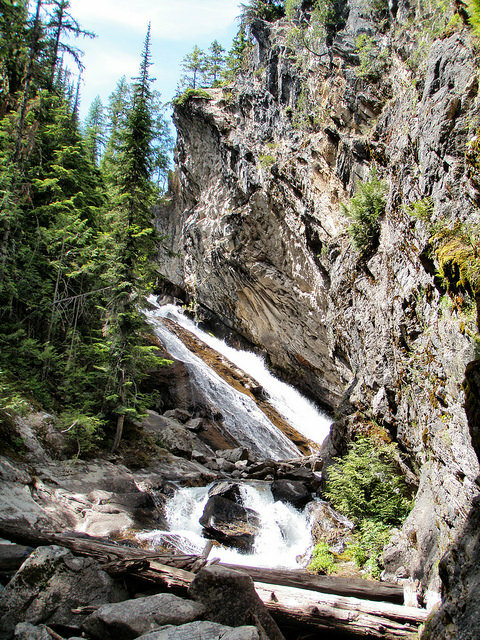 There are two sets of falls at Granite Falls, an upper and lower. 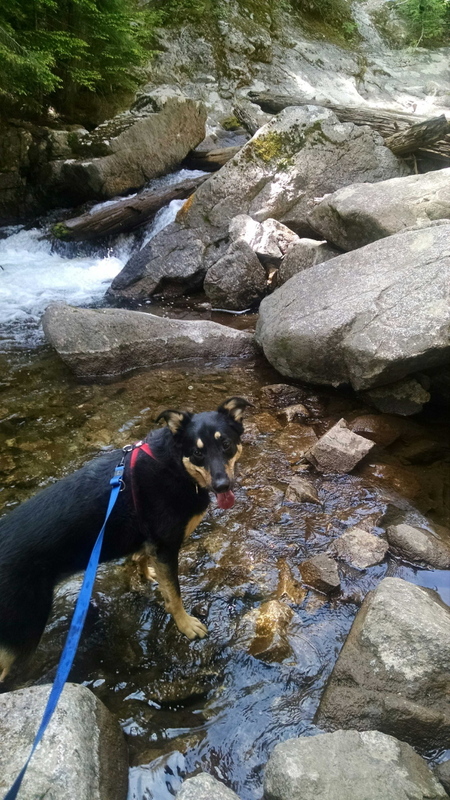 Boomer and I started our way up the hillside to the upper falls. The trail to see the falls is fairly short, about 1 mile (1.6 km) round trip. The hike carries on taking you to a T intersection. 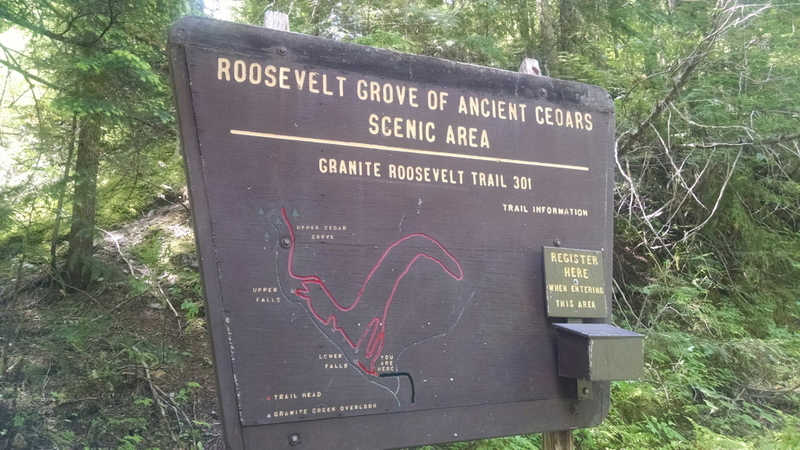 Here you make the decision to continue on to the Roosevelt Grove of Ancient Cedars or back to the parking lot. 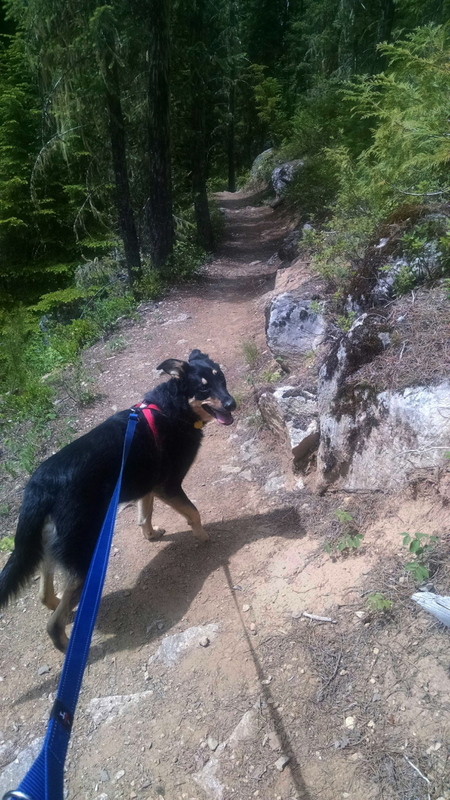 Boomer and I always enjoy seeing large trees so we took the trail up to the cedars. The ½ mile (0.8 km) trail was maintained, for the most part, however, there were some down trees that we had to crawl through. 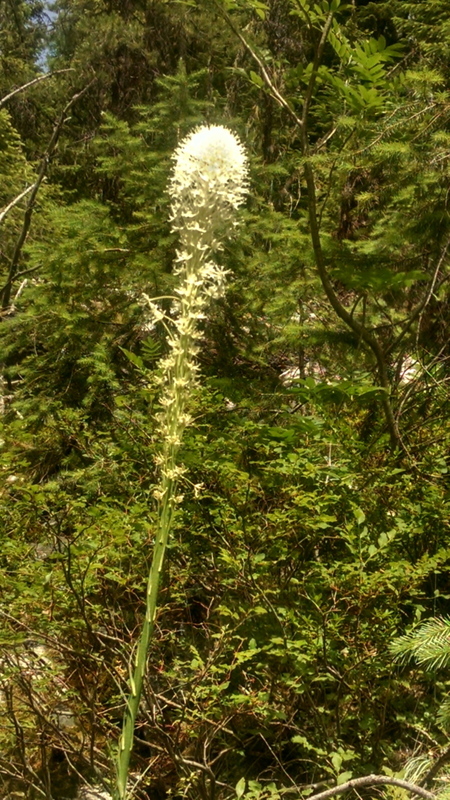 Bear Grass… there has to be bear around, right? 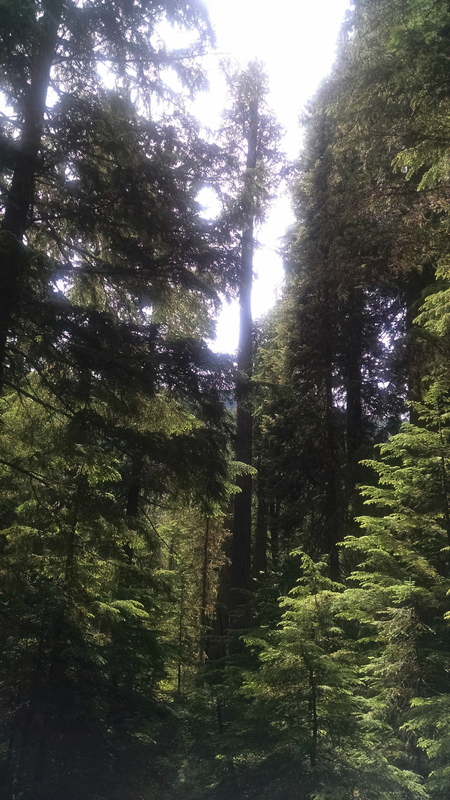 Since this is grizzly country I brought along our bear bell, which I am sure was sufficient but since we appeared to be the only ones who passed by the down trees that day we did not venture too far up the trail. Mostly because anytime I heard any noise I freaked out a bit and was convinced it was a bear. Which I am sure there was no need to really freak out and I am just a neurotic person who owns a neurotic dog. We feed off each other. We made our way back to the parking lot but before we left we took in the view from the lower falls. This is my favorite spot of Granite Falls as the falls appear to be flowing diagonally instead of down, like a traditional waterfall. Boomer and I sat there admiring the falls but it was not long before Boomer found his way into the water. Boomer found his way to the water! This dog loves himself some water.